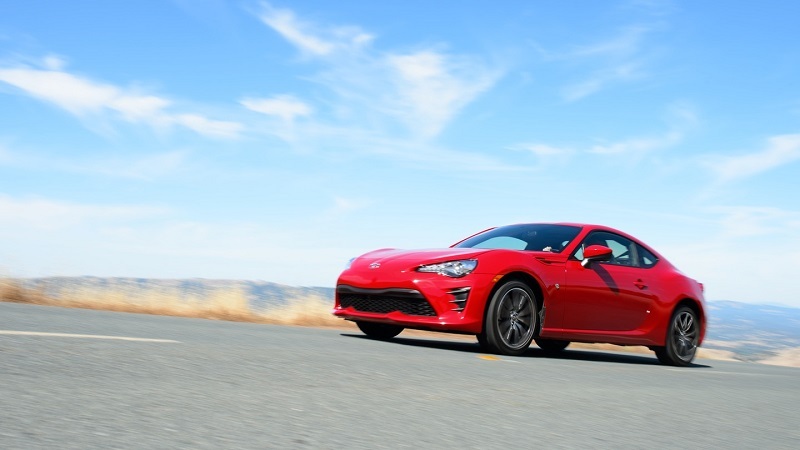 Toyota has set quite a remarkable record when it comes to introducing high-performance car models, with each year leaving us with breath-taking improvements. But the latest from the Japanese automobile giant, Toyota GR 86 Sport is a little bit restrained. Let’s not conclude yet! Sometimes, it takes the third-eye to find the gimmicks. Toyota had focused more on improving the intrinsic technologies to boost driving experience and that billed the new GR 86 Sport as a car for daily driving. Equipped with aerodynamic side skirts and front splitter, the sport car prides black polished 17-inch aluminum wheels and red calipers fitted in a Brembo braking system; four- and two-piston calipers at the front and rear respectively. Options to iterate the Toyota GR 86 Sport interior is limited but the designers lack no pace in matching your fantasies. The leather-wrapped steering wheel is slightly smaller in diameter with GR emblem and silver contrast stripping. On the engine switch (start/stop) button and the instrument cluster are the GR badge also. The Toyota GR 86 Sport also features the standard keyless entry, dual-zone auto climate control and revised airbags (7). More on safety are new Track mode on Vehicle Stability Control (VSC) and ABS with brake assist and EBD. Toyota improved rigidity on the performance front by adding a rear brace. That marks the most notable upgrade on the chassis. The new GR 86 didn’t get any additional power. Under the bonnet is the 2.0-liter FA20 D-4S direct-injected four-cylinder engine which generates 204 hp/152 kW (207 PS) at 7,000 rpm (maximum power) and 156 pound-feet (212 Nm) of torque sent to the rear wheels. The engine can be matched with either a six-speed manual transmission or an automatic gearbox. At the launch yesterday in Japan, Toyota revealed a handful of GR Parts for the 86, including accessories for the GR Sport, GR, and the standard car. These include all the additions available for the GR Sport including the aforementioned components; a GR-branded starter button, the GR steering wheel, front splitters, two sets of wheels, and a rear spoiler. Another option that will interest you is a limited edition infotainment system with GPS navigation system, GR T-Connect – limited to 200 units with Toyota Gazoo Racing Recorder featuring a racing recorder; rally and lap timer and a collection of performance-oriented displays on a 7-inch screen. The Toyota 86 GR Sport sales are going now in Japan starting at ¥3,780,000 ($34,140). The lineup is expected to have options for GR’s Rays alloys, rear suspension brace for GR Sport and a front steering rack brace. Toyota is supplying the GR 86 Sport in only three different exterior colors: Crystal White Pearl, the famous Pure Red, and Crystal Black Silica.